HERE, FISHING, HUNTING AND SPORTING CLAYS ARE AMONG A VARIETY OF OUTDOOR PURSUITS THAT ARE AS VAST AS OUR SURROUNDING LOWCOUNTRY WATERS. Here is the start to a day of fishing, kayaking, boating and simply enjoying the river at Oldfield. We are blessed to employ 2 full time fishing guides. From the Outfitter’s Center, they coordinate and conduct guided fishing excursions of all forms, from fly fishing for reds on the marsh flats, to catching tarpon and cobia in the Sound, to heading off shore for bluewater trolling and bottom fishing. Our full time Naturalist hosts a series of education events for all ages and is always available to expose our Members to new natural experiences on the river, in the ponds and throughout this amazing natural environment we enjoy. Should you prefer to enjoy boating on your own, the Outfitter’s Center offers a private storage and launch service for your personal boat – giving Oldfield Members full access and use of our most precious resource, the river. Here you will also find two community boats for frequent Charter excursions. Through the Outfitter’s Center, Oldfield Members also enjoy access to one of the premier wing shooting plantations in the South – Turkey Hill Plantation. 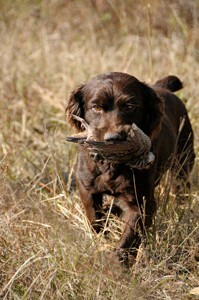 In addition to a top tier sporting clay range, its 3,500 acres of managed bird woods offer exceptional quail hunts. Spring brings us plenty of options as the days become longer and the water warms up. The inshore flats fishing will be “heating up” as hungry red fish, flounder and oversized sea trout go on the prowl around the mud flats and shallow water oyster bars. Sight fishing with light spinning tackle and flies are the methods of choice to catch these fish. Also look for “tailing conditions” to get going as redfish start to move up onto the grass flats in search of small crabs. Early spring offers up some fantastic near shore wreck fishing. These wrecks lie anywhere from 3 to 6 miles from the beach and play host to many hard fighting and great tasting species including sheepshead, black sea bass, summer trout, flounder, and black drum. Further offshore, around areas of live bottom and limestone outcroppings, you can catch snapper, grouper, triggerfish, and black sea bass until your arms are sore. As we approach May cobia averaging between 30 and 60 lbs take up residence in the Port Royal Sound and around the offshore wrecks and reefs providing amazing sight casting and live bait fishing opportunities. Summer fishing can be summed up in two words…”mixed bag!” You can catch just about anything that you want over the summer months. The inshore estuary will hold good numbers of redfish, flounder and trout which are easily caught on light tackle using live bait, lures and flies. One of the most exciting ways to chase summer reds is over the short grass flats as they cruise and “tail” in mere inches of clear water. This is a combination of hunting and fishing as you stalk the fish and position yourself for just the right cast! The fishing action for “BIG” fish is also on fire in the Lowcountry during the summer months! If you want to catch big fish on light tackle this is the time to do it. Many species of large shark including black tips, spinners, duskys, lemons, bulls, and tigers take up residence in the deep waters of Port Royal Sound and can be targeted a short ride from the dock. Tarpon in the 80 to 140 lb range also move into the Port Royal Sound and surrounding waters during this time offering the opportunity to catch what many sportsmen consider the ultimate gamefish. Further offshore the wrecks and artificial reefs are teaming with cobia, barracuda, amberjack, grouper, snapper and king mackerel and offer an excellent opportunity for catching a wide variety of gamefish during a single trip. The fall months offer some of the best inshore fishing of the year for trout, redfish, and flounder! As the days become shorter and the water temperature drops our fish feed with reckless abandon to bulk up for the winter. Inshore redfish will cruise the flats foraging for food and schools of trout will stack up around the creeks and shell bars looking to ambush shrimp and small bait fish. Tarpon continue to frequent the sounds and rivers during the early fall and are often caught while targeting schools of 20 to 40 lb bull redfish that migrate to inshore waters during this time. As the waters cool the near shore wrecks come alive with summer trout, bull redfish and black sea bass. The fall months also provide some of the best offshore bottom fishing of the year. Live bottom areas in 80 to 120 ft of water produce some incredible action with grouper, snapper, triggerfish, black sea bass, amberjack, and king mackerel. The winter months play host to a number of excellent fishing opportunities. Some of the best redfishing of the year occurs during this time as they gather by the hundreds in crystal clear waters covering shallow flats. We generally target winter redfish by quietly poling the flats boat across the shallows looking for fish as they move along the bottom. This sight fishing method yields plenty of opportunities to cast artificial lures or flies to these fish! The offshore bottom fishing for grouper, snapper, sea bass, trigger fish, and porgies continues to be red hot through the winter month. The near and offshore wrecks and reefs also provide awesome action from December through March. Bull redfish, shark, sheepshead, black drum, flounder, and sea bass round out the target species in these areas. The wreck fishing for sheepshead is exceptionally good during the winter months and typically yields plenty of great fillets for the cooler!